while he was offering the Holy Mass. In fact, he was martyred – at least, that is my own opinion. 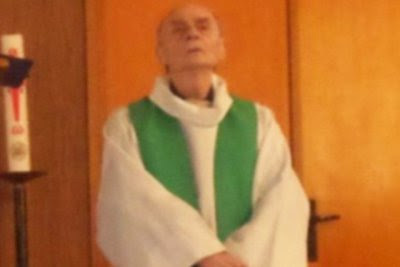 His name is Father Jacques Hamel. May he pray for us! where Christianity has existed almost from the beginning. we don’t expect this to happen in France. Let’s remember who the true author of persecution of the Faith is. Christians who are driven from their homes in Iraq or in Africa. in so many places around the world. for the love of Jesus Christ? most of us aren’t going to face that. You and I are likely to face rather different choices. to a referendum defining marriage as a man and a woman. Now, I don’t know anything about Mr. Eich’s faith, but here’s the point. what do you think is likely to happen to the rest of us? a lot of people are concerned that it may induce an abortion. and not be made to cooperate with this. Their case went all the way to the U.S. Supreme Court. They lost. or else stop being pharmacists. or a job, or a career, as the price we pay for the love of Jesus Christ? you may be called some names. You may lose a friendship. Let me say something to our students. either in a few weeks, or in the next few years. shelters us from a lot of ugliness. Some of you are in for a shock when you get to college. won’t be very tuned into their Faith. a lot of which you may not even be aware of, will be gone. I’m not trying to scare you; and I’m not saying you can’t handle it. for the love of Jesus Christ, and it may take you by surprise. who won’t be able to stand up to it. as the price you will pay for Christ? Don’t be overwhelmed. Be encouraged! and when the shock passes, something wonderful happens. Actually, several wonderful things happen. First, you realize: I’m stronger than I thought. Second, you look around, and there will be people with you. It may not be very many, but it doesn’t have to be many. Just one other person will give you great courage. Third, you will feel a spiritual power unlike anything you’ve ever known. You will know it isn’t your strength, but the strength of Jesus Christ. How martyrs have such superhuman courage and peace. You’ll feel it. about being close to those who are maligned and attacked for his sake. You’ll feel Jesus right there. And nothing in this world means anything compared to that. for being faithful to Jesus Christ. Faced his martyrdom with courage and grace? One answer is that it is supernatural grace, and that’s true. are prepared for by small and boring ones. My parents never gave their lives for me all at once. and be faithful to the Lord and to his people. * I made this change after the 5 pm Mass. The first reading mentions the sins of Sodom and Gomorrah, so let’s start there. you can read about it in chapter 19 of Genesis if you want. I’m going to talk about three things in this homily. First is the sin of Sodom. The second is hell. And the third is hope. 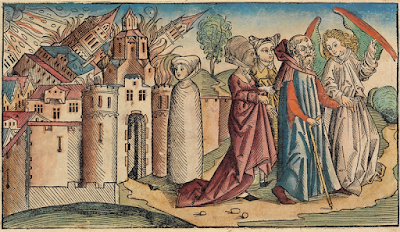 So let’s talk a little about what was going on in Sodom. and now there is intense social pressure for us to keep quiet. After all, we can always talk about something else, can’t we? But when the subject comes up, you and I have a duty to speak up. It came up in the readings, so I’m speaking up. and first we have to address that. So, for example, many people tend to identify and define themselves by an attribute. Let me use a personal example. * My “ampleness” isn’t a result of a bee sting! It’s a result of eating too much over the years. That’s a moral failing of mine; it’s one of the deadly sins, gluttony. indeed, shape their lives around food and eating. a show about people who are over 600 pounds as a result. it sometimes seems like we’re making it out to be the worst possible sin. and it’s possible to commit mortal sins involving all ten. So we don’t want to overstate the matter. It’s also necessary to make very clear that feelings aren’t sins. but virtue lies not in impulses, but in our choices. but a more general state of moral madness. It’s an excellent article, you can find it online. a faculty for disgust, for revulsion, and he compares it to our sense of smell. smells repugnant to us, because eating such flesh would be bad for us. And his point is that our moral sense is meant to work that way, too. then we will find ourselves consuming what is bad for us, and claiming to like it. And that’s what was wrong with Sodom and Gomorrah. It wasn’t just one moral failing. They’d completely lost their way. because it means they had reached the point of no return. There is another word for the point of no return: it’s called hell. but God wanting to rescue all that he can. If you read on, there aren’t even ten innocent people. and if you read the next chapter, they weren’t exactly innocent, either. But what they were was salvageable. They weren’t beyond hope. So God sends his angels to rescue them. whether being saved from moral danger or physical danger. and I had my head out the window. a car coming the other way came frighteningly close. and something blocked my way. And I bet that’s happened to you, too. because God knows these things, however attractive, distort us. It’s not all at once, it’s little by little. do you think many people really set out in life to go there? that sense of revulsion from what is evil. All right, enough fire and brimstone. Let’s turn to what Jesus said in the Gospel. He told us: God wants to give us good gifts. He is eager to give them to us! He wants us to want them. to what truly is good. We first receive the Gift of the Holy Spirit in baptism. to any and all sins we may confess. I’ll say it again: the Father wants to give us good gifts. He offers us total and complete forgiveness. He offers us chance after chance. He offers us life in the Holy Spirit. He offers us life with the Trinity forever. It’s so easy! *At the 5 pm Mass, I used the example of my being left-handed. Afterward, I decided an example of a moral failing would be more apt. at your house, what would you do? - Clean the house; I mean, really clean the house! - Go to the store and get the fancy stuff – the very best food. - Clean up the kids. run to the hairdresser, maybe? that they are to be on their very best behavior! - Maybe mow the lawn? Trim the hedges? Put the garden hose away? What kind of meal would you fix for the Lord? so that means he kept Kosher. How do you cook Jewish food? What can you fix for him? Do you serve drinks? He did make wine; would he like a beer? In a glass, or would he just drink it out of the can? maybe you decide beforehand that everyone will be all smiles. if they are too much of a mess. until after the Lord goes home! Doesn’t Jesus already know what your house looks like normally? what you and your spouse are arguing about? and instead, you let things be real. and ask for his help. Ask him the questions you’re dying to know the answers to. doing as much as he can, for you? but a joy – and you don’t want him to leave. By the way, my question isn’t just for the homily. I encourage you to take this question home with you. If Jesus were coming to stay at your house – what would you do? I suggest this for a couple of reasons. First, this is a really powerful way to pray. Saint Ignatius of Loyola recommended it. such as the readings we’re talking about – and use your imagination. Put yourself in that scene. Would you be Martha? Mary? Abraham? Sarah? One of the servants? How would you react? What would you do? that’s the heart of prayer! because we are with our Creator and our Redeemer. Nothing is hidden, and nothing need stand between us. from the morning Mass until around 8:45 pm when we have Benediction. and to enter into that friendship. Maybe it’s hard, at first. What do I say? How do I talk to God? Do I have to use certain words? and read his words. Imagine you are with him. Tell him what hurts. Bring the names of all the people you care about to him. God wants to come and visit with you, today. I think we are all aware of the ugly events of the past week. In Dallas, five police officers were murdered, and several other people were wounded. You may not realize that police officers were shot at in other places as well. The shootings in Dallas came a day after two controversial incidents in which police, in carrying out their duties, shot and killed two men. And all that is against a backdrop of concern and suspicion about other incidents in which people died in interactions with police. Now, we know these situations get misreported and misrepresented by media, by activists and politicians. And we know these things are not always clear-cut. One case is not like another. We know the police have a difficult job; so a lot of time our sympathy goes with them. On the other hand, some of the situations look pretty bad, and it's hard to understand why the police acted as they did. There is a tendency to take sides; but as someone else pointed out, it really is possible to be supportive of the police, and yet also be concerned when things go too far. -- Of course, nothing justifies cold-blooded murder -- by anyone. -- Just because there is racism, and there is, doesn't justify violence. -- Just because being a police officer is dangerous, and it is, doesn't mean anything goes. This is a mess, because there is so much anger and fear; even if it's based on false claims or misunderstandings doesn't change that. This is a climate in which a lot more ugliness can occur. Well let's begin with the words of Jesus in the Gospel. He was asked, "who is my neighbor" -- and with his parable, Jesus gives the answer: anyone; everyone. No, we can't solve everyone's problems, but that doesn't mean we don't have to care, and do what we can. A good and necessary step is to seek greater understanding. Suppose you had a neighbor, and you looked over, and thought, gee, they don't take very good care of their yard, and the house needs to be fixed up; and their kids are playing outside pretty late all the time, and they don't look very well cared-for; and while you see all this, in your house, you are forming a definite idea of the sort of people they are next door. But what if you went out of your house and went next door? Then you might discover some things: that perhaps one of the spouses is ill, and the other spouse is so busy caring for the other, that he or she can't keep up with the kids. Or perhaps there is only one parent carrying the whole load? Maybe they don't have much money so they can't keep up with things; and maybe they don't know anyone to call to help them. My point being, once you are actually in the situation, you might understand the situation rather differently. What goes on in our cities is depressing, and should alarm us. The poverty isn't so much of material things, but of education; we have schools that don't work very well, and add in crime and drugs, and behind all that are lots of broken families. You and I get frustrated, because we are taxpayers, and we spend large sums of money and nothing seems to do any good. So it's tempting to look away and brush our hands of it all. But they are our neighbors. And, if we want, we can go and find folks who are beaten and half-dead in Troy, in Piqua, in Dayton and Sidney. Finally, you and I can ask the Holy Spirit to guard our hearts against rash assumptions and writing people off, and from anger. We've had bad times before. In times of conflict, God raises up people who bring a voice of calm and peace; I don't just mean towering, national figures; I mean lots of ordinary people, speaking and praying words of faith. We never seem to have enough of such people. So, how about you and I tell the Lord at this Mass, we're willing to be such people, who speak peace, instead of cynicism and rage? 240 years ago we declared our independence! and shooting off fireworks today and tomorrow. I love our nation’s birthday, I am sure you do too. and I was spending a month in South Korea. and it was the only 4th of July I spent away from our home. to our country and family; as a son or daughter to a mother or father. “That’s like saying, my mother, drunk or sober”! but I surely want better for my mother, and for all those I truly love. to be right, rather than wrong. the prophet Isaiah loves his country, too. In his time, she was in deep trouble, in every way. in the arms of their mother, Jerusalem. and draw life from, the City of God. is that this is about spiritual abundance, spiritual life. Which means, the nation has to save its soul. on this 240th anniversary of our Independence: the soul of our country. I need hardly recount all the reasons to be concerned. Our laws continue to allow the destruction of unborn children. And, of course, there is the deep confusion about what marriage is. crime, and drugs, and broken families. Now, what sort of problems are these? but they are also a spiritual problem. and it is the same for us. and, likewise, so must we be in our time. Well, notice what Jesus told the 70 disciples. He said, stay focused, don’t get distracted along the way. but make sure you bring a peaceful spirit. If your peace isn’t accepted, it will come back to you. So as I said last week: don’t get worked up, get prayed up. One way to keep our focus is frequent trips to confession. a good confession helps a lot to get our priorities in order. he didn’t say, “how terrible this is!” – even though it was! Nor did he just give up. because that is when he poured out his grace on the world! That is what you and I, as disciples of Christ, bring to our country. Yes, we speak out; yes, we vote; yes, we get involved. unless it is in the grace and power of Jesus Christ. let us offer words and actions bathed in prayer and full of grace.